Located in the historic centre of Isfahan, Masjid-e-Jameh Yazd (‘Friday mosque’) can be seen as a stunning illustration of the evolution of mosque architecture over twelve centuries, starting in ad 841. 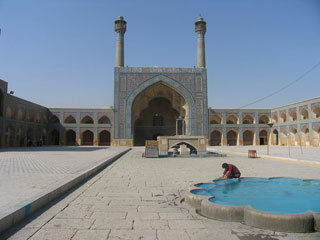 It is the oldest preserved edifice of its type in Iran and a prototype for later mosque designs throughout Central Asia. The complex, covering more than 20,000 m2, is also the first Islamic building that adapted the four-courtyard layout of Sassanid palaces to Islamic religious architecture. Its double-shelled ribbed domes represent an architectural innovation that inspired builders throughout the region. The site also features remarkable decorative details representative of stylistic developments over more than a thousand years of Islamic art. This article uses material from UNESCO World Heritage List article "Jameh Mosque and Square of Isfahan", which is released under the Creative Commons Attribution-Share-Alike 3.0 IGO License.